Besides being the leading company in Japan’s convention industry, Congress Corporation provides human resources services leveraging our track record of success in managing international conferences, and the knowhow we have amassed through managing over 80 facilities. Having a personnel register well stocked with human assets with high-level language and communication skills, we are able to provide outstanding staff. Our services have helped our clients solve problems by enhancing their own work efficiency. Over the years, this has earned us many plaudits. Congress Corporation has operated various pavilions at large-scale global exhibitions. 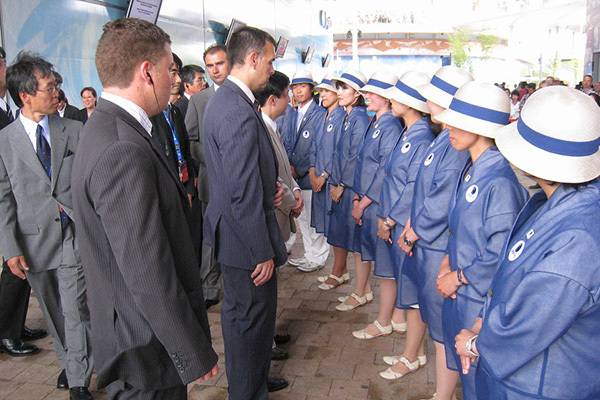 Our comprehensive service is underpinned by a deep understanding of each pavilion’s organizational system and operational style, and of the customs, culture and traditions of the relevant country. This, along with the thoughtful and meticulous Japanese-style hospitality we provide, has earned us high praise from clients in Japan and overseas, along with positive media coverage on many occasions.